The Professional Mentoring Programme works with eligible University of Plymouth students to raise aspirations and career success. The programme matches undergraduate and postgraduate students with experienced professionals for a one to one insight into their specific sector over a six month period. Student mentees will have an opportunity to improve their personal and employability skills, whilst mentors gain personal and professional development. Our mentors are a mix of alumni and non-alumni volunteers, based across the UK and in a range of sectors. How will I benefit from the Professional Mentoring Programme? we recommend a minimum of six meetings, these are flexible, and are arranged around the mentor’s and mentee’s schedule. Meetings take place once a month and last for one hour. They can be conducted face to face or via email, phone, Skype etc. attend the Professional Mentoring Celebration Event which concludes the event in April. This event brings students and mentors together to celebrate achievements and share experiences and feedback. be aware it is a six month programme which you are prepared to fully commit to and work around the busier times of your course and your mentor’s schedule. The Professional Mentoring Programme for 2018–19 is open to student applications! To apply please complete the online student application form. The deadline for applications is Friday 5 October 2018. Or contact us at mentoring.careers@plymouth.ac.uk / +44 1752 582004. We are always looking for enthusiastic mentors who would like to take part in this mutually beneficial programme. We accept applicants from any job position in any industry, and previous mentoring experience is not necessary. Full training is offered prior to meeting your student mentee, and support is available from University staff along the way. If this opportunity would be of interest to you or one of your colleagues, please contact one of our team for further information, or complete the profile above and return to a member of the team. Contact us at mentoring.careers@plymouth.ac.uk / +44 1752 582004. "I decided to request a mentor because I wanted to take advantage of every opportunity available to me. I covered a wide range of topics with my mentor, from tailoring my CV to suit different job applications and preparing for job interviews. As a result, I was offered a number of interviews and with the help of my mentor I have been offered a job at a leading institution." 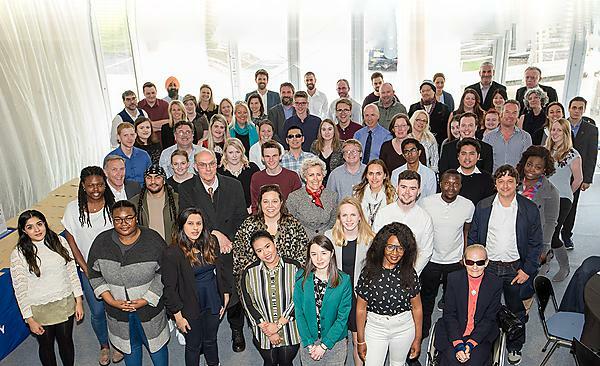 "I have thoroughly enjoyed this experience and like maintaining the connection with the University of Plymouth and supporting students. Bernice has put in a lot of hard work during our time working together and she would be the first to tell you that it paid off. It has been a real pleasure to have been a part of her journey." "I needed that boost of confidence to help me apply for graduate jobs and I wanted advice from someone who knew what to expect in the big-wide-world. I learnt so much from my mentor, from how to perfect my CV to how to express myself and my experiences in interviews. I loved going to the work shadow day with her, where I got a great insight into what she does on a daily basis. Everyone says they’ve noticed such a big change in my confidence and self-belief. I owe it all to Nikki and without her support, I wouldn’t have been able to secure a graduate job." "Francesca has been a super mentee. We covered confidence building, networking, LinkedIn, CV's, cover letters, job applications, stress and handling workloads, work experience and interview skills. Seeing her gain confidence and get a job made me so proud of her." "I requested a mentor because I wanted to know more about employability in engineering, especially in robotics. We covered a variety of subjects including CV and interview skills, things I could get involved in whilst at university and the next step after my degree. Stephen has motivated me to become a subject-specific student ambassador, get a summer internship and upgrade my degree to an MEng." "I became a mentor for the opportunity to offer advice and the relay what I learned from my time as an undergraduate. We discussed the different postgraduate options available, identifying and developing soft skills, the importance of networking and finding university resources that can help him achieve these goals. I've really enjoyed the experience, it is rewarding to see someone taking different decisions about their career path because of input you've given." "I decided to enrol in the mentoring programme because I wanted to improve my employability skills and my chances of finding the right job after my studies. I have enjoyed and benefited from the mentoring process. With my mentor, I have explored a variety of career options and job hunting strategies as well as techniques to best present my skills and qualifications to potential employers. Having participated in the mentoring programme, I believe I am better prepared for my future career." "Mentoring with the University of Plymouth has been a brilliant experience and opportunity passing on the benefit of my experience. I have enjoyed seeing the confidence of my mentee soar over the course of the mentoring relationship." "I saw the mentoring programme as an opportunity to improve my confidence and employability. With my mentor's help, I was able to improve my interview technique through practice. I visited his workplace and spoke to current placement students to get a feel for a working environment. Tom has helped me build my confidence and my skills have greatly improved since our first meeting, and I was able to use them to secure a graduate position after my first interview." "The mentor programme has been an enjoyable experience, seeing your mentee progress and achieve a role they want has been extremely rewarding and I would recommend the scheme to both mentor and mentee. Both parties benefit from developing and learning skills and the satisfaction of a job well done. It helps when someone tells you that you’re doing well and gives you the confidence to reach out to a prospective employer." "I have gained a lot from being mentored, we covered a range of subjects from confidence building and writing an outstanding CV, to the usefulness of work experience. I enjoyed completing a mock interview where I applied for a customer service adviser role which was a great experience. The employer mentoring programme has made a huge difference in my life and the experience has changed how I view my future." "I decided to become a mentor because Santander is an advocate of supporting the communities we work in and mentoring is a rewarding way to give something back. I have particularly enjoyed seeing Ruth grow in confidence and gain a wider understanding of the business world." "I decided to request a mentor to become more employable and because I wanted to know more about the third sector. The programme has made a huge difference, I now have a professional CV and know how to adapt it to different job specifications which have helped me gain several summer internship offers. I have also gained valuable knowledge of the third sector and the many opportunities out there." "Mentoring gave me the opportunity to support the journey of a student at the start of their career. Sophie led on the skills she wished to cover from CV writing to vetting opportunities to make sure they meet Sophie’s career needs and aspirations. The experience has made me aware of how hard students work, I found Sophie’s determination, resilience and commitment inspiring and I wish her well for her future."